Some of my earliest memories of the Marvel comics character ‘The Punisher’ come from the old PlayStation 2 game. 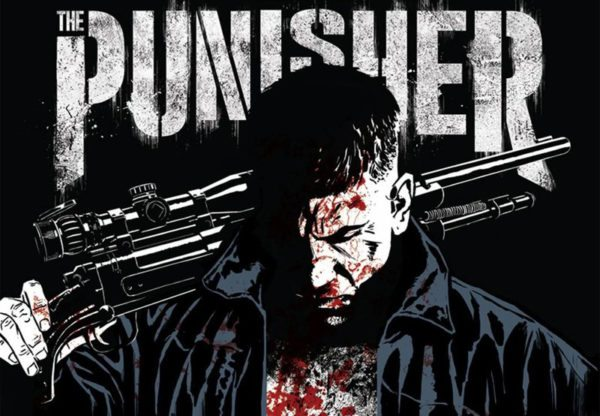 A gritty third-person shooter where you could have Frank Castle (who, in this incarnation, stood at well over six feet tall and wore a flowing black trenchcoat) kill people the old-fashioned way, or come up with grisly, carnival-esque assassinations for special targets. Wood chippers, alligator tanks, sledgehammers – I watched my friends and their friends shout and exclaim from on top of a bunk bed as Frank’s impassive 3D face judged the violence, both of us silent and impassive. It was a tough game, too – you didn’t have many bullets for your many guns, and the PlayStation controller wasn’t always the most reliable or the easiest to use in the over-the-shoulder third person setting. The ostensible reward was to make it through the trials and tribulations to achieve as many implausible assassinations as possible. It was the same with many of the other games my friends owned. Ninjas, robots, fighting games involving obscure Japanese characters, they were all of them gory, messy, pushing the limits on gallows humor and turning it into macabre comedy. None of my friends who played these games were out of high school yet, and no one we knew who played them was older than a college student. I didn’t have the money to buy them for myself, but many of the gamers I knew worked and scrimped and saved and begged till they got the scratch to get those colorful plastic boxes with silver game discs inside. It was community, it was escapism, it was friendship and rudimentary brotherhood and complex fun. It was a part of adolescent life. There was a healthy amount of scoffing at people who believed that violent video games made you violent. Just as we enjoyed more innocent delights like Tetris, bowling and birthday parties, we enjoyed staying up till three in the morning to watch one guy perform the ultimate combo and unlock the ultimate weapon to perform the ultimate kills. The point is that gore is not the point. Grit can be, if we’re discussing movies like Batman Begins or Sin City or any kind of noir, western or pulp film involving the tough-as-nails tropes. Grit can be discussed when our setting is Gotham or Chicago or a crime-ridden suburb. But the Netflix series The Punisher does not allow us to make grit the point either, bloody a show as it may be. Thirteen episodes of Jon Bernthal as Frank Castle killing everyone who crosses him and almost getting killed in the majority of the fights he gets into make it clear that grit isn’t enough. His companions say as much. David Lieberman calls his signature skull vest a memento mori, a reminder that this road he’s on will kill him. Castle’s enemies like Agent Orange and Carson Wolf call him out on the stupidity of going after them alone. Yes, he often triumphs against greater odds, but what the show makes clear is that these victories come at a cost. Whether it’s physical, like a stab wound or a bullet hole, or emotional like the death of a friend or the loss of an ally, the Punisher suffers ruin in his wake. The show puts it, rather bluntly, another way, that he walks between two worlds. For him there is our world, the reality of a post-9/11 New York, and the world of war, not just the conflict in the Middle East, the war that created him, but the war of vengeance against those who killed is family, the war that is constantly recreating him. He’s not the only one who has to walk the line between these realities. The circle of veterans that people the show – Curtis, Billy, Lewis, O’Connor, Gunner – they all are coping, surviving, trying to live ‘their second life’ as Curtis puts it. Lewis’s death can be seen as the failure of grit in the scope of the narrative. He recalls the lessons of his drill sergeant, but stammers, breaks into sweat, panics and is unable to be “like a soldier” in the end. He cannot soldier the way the Punisher soldiers, where he watches the light of his victims go out of their eyes. Lewis must make bombs and write letters, place himself at a distance so he can blame others for his wrongs. This is so much more than a blank statement about PTSD. This is a real commentary on the lives of veterans, on being let down by the system and the utter failure of the military-industrial complex to train soldiers for a life after war. In What It Is Like To Go To War, KarI Marlantes makes the case that soldiers need pre and post-battle rituals to help them do their duty and survive, just as much as they need gear and training. Spiritual, psychological, whatever, they need something, because right now, the people who return from war are suffering unseen. Grit, in the end, only gets you so far. Returning to gore for a minute, much of what we deal with in The Punisher series is the aftermath of battle, the gore not of causing wounds but of recovering from them. Hasty surgery on kitchen islands, pulling out bullets and arrow shafts, stitching up cuts and icing bruises is more the gore of the “ER” drama, not a comic book TV show. But, as they did in Daredevil, Frank Castle rarely walks away from a fight not just unscathed, but free from deeper harm. What distinguishes the shows with regards to gore is mostly choice of weapons – Matt Murdock fights ninjas in close quarters, Frank Castle fights mercenaries with an array of firearms and explosives – but also who does the patching up. Claire hangs out with Daredevil and is happy to nurse him back to health. But Frank is a loner. Frank is a wanted criminal. He has to rely on the unsteady hands of David Lieberman or the solemn attitude of Curtis to be healed. Gore becomes about who provides care, a statement that, once again, connects to the issues veterans are facing in this country and around the world. No, grit and gore walk alongside the Punisher, but they are second stringers to the refrain, the line that runs under the entire season that the audience is not allowed to forget. War is hell, yes, we see it in the eyes of the veterans and in the moments of flashback we get to Afghanistan. War does awful things to men and makes them do awful things to others. War is hell, but what comes after is worse. What The Punisher does best is show us the myriad ways that people deal with what comes after, successfully or not. Whether it’s the successful Billy Russo and his suits, or the empathetic Curtis with his group therapy, the drive of the show takes the criminal narrative and blends it successfully with the life-after-war motif, forcing everyone to rethink, re-examine, reevaluate what’s important for their daily lives. It’s something wonderful that you don’t always see in media, letting the issues combine with the story rather than using issues as signposts during story sequences. Arguments against this tactic have been made in the case of The Punisher, claiming that it stretches the show too far, it provides too many openings for empty episodes and mid-season drag. This does bear consideration, given thirteen fifty-minute episodes to provide exposition, character development, rising action and so forth. It is important, however, to remember that The Punisher is not just about the story of Frank Castle. He forms the central narrative, of the cycle of betrayal and revenge, but remember, it’s not just the grit and gore of his world. We are in the real world of war veterans, and we see their madness, grief and fear as often as we see their heroism, their patriotism, their idealism. We see it at the end of the series, where the Punisher joins Curtis’ group, and reveals that he too is afraid in the absence of war. This fear, after he’s done so much to so many, is what remains. It’s not a fear for his life or a fear of repercussion or that he’s going to lose his edge in the absence of combat. It’s a true fear of self, of the loss of one of his worlds and the line he walked in the space between them. It’s important to let that linger, to reverberate in the wake of all that has happened. Because that is where the space for healing, for moving forward, can begin to form.